1) The report is dated November 8, 2013 and posted shortly thereafter. This would be on time for a monthly report. However it is a record for a year end report which usually does not appear until late December. 2) September was a decent month. 3) Amtrak ended the year $54.2 million better than budget. On a cash only, basis it finished the year at $355 million; which is better than expected for FY2014. Since Congress appropriated for operating expenses $443 million for FY2013, this means that there was an extra $88 million available for other corporate purposes. 4) Amtrak signed contracts with states or operating authorities for all of the existing corridor trains. 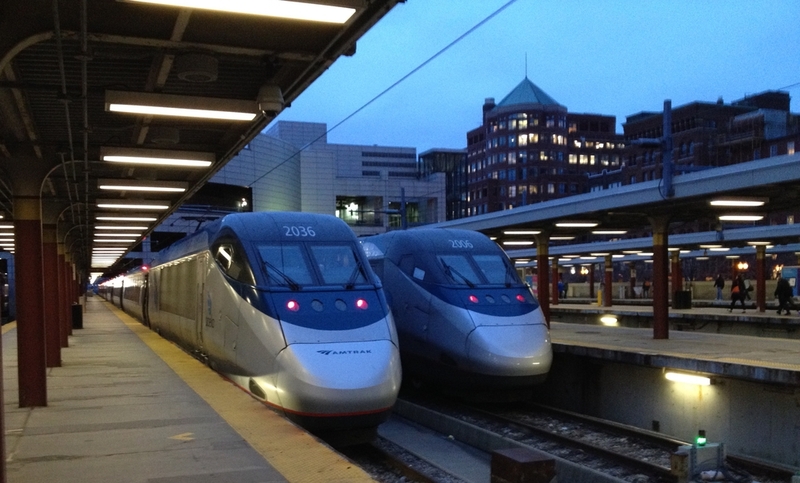 5) Six product lines had operational surpluses for the entire year: Acela with $236.9 million, Northeast Regionals with $133.0 million, Washington-Lynchburg with $3.5 million, Northeast Corridor Specials with $3.0 million, the Adirondack with $0.6 million, Non-North Corridor Specials with $0.5 million and the new Washington-Norfolk with $0.4 million. 6) Amtrak employment grew by 24 to 20,151 employees. 7) Cash on hand at the end of September was $289.1 million (a decrease of $1.5 million from the end of August, 2013). Amtrak was able to get through the shut down in October with no problems at all. Restricted cash shrunk by $0.462 million to $6.813 million. 8) Net interest paid in FY2013 was $13.2 million better than budget and $39.4 million improved over FY2012. 9) Long term debt increased in September by $21.301 million principally because of draw downs on the RRIF Loan for the new electric locomotives. Current maturities also increased by $0.957 million. For the entire year, long term debt decreased from $1,556,043,000 to $1,496,533,000. Most of this was accomplished through the early buyout of capital leases that were created to complete the electrification project between New Haven and Boston. Unfortunately the agreement between the DOT and Amtrak that allowed this has expired. 10) In fiscal 2013 Amtrak spent a total of $1,047.570 million on capital projects. $16.004 million was spent on the Major Bridges project (mostly Niantic River Bridge) and Acquisitions of $62.372 million. During this time Amtrak repaired 37 turnouts, retimbered 5 Bridge decks, converted one bridge deck to ballast, renewed 7.4 miles of catenary, replaced 1 transformer and laid 68.3 miles of signal cable (mostly between New Haven and Springfield). It also overhauled 153 Amfleets (two more than budgeted), 86 Superliners, 15 Horizons, 9 Heritage Diners, 12 Viewliners and 13 Surfliners. 11) Ridership for FY2013 was 31,559,945 which was 319,380 more than the previous year. However no line was more than 10% improved over the previous year. 12) When the short-term continuous resolution was passed by Congress, Amtrak got approximately $129.87 million in operating funds and $265.01 million in Capital and Debt Maintenance. While another shut down in January is not likely, Amtrak now has the resources to take it through the end of February. There are rumors that a modest budget compromise between Congressman Ryan and Senator Murray has been reached, it would still have to pass both houses of Congress. The word is that the compromise does not cause any more cuts to Amtrak. If the compromise is not passed and a continuing resolution goes forward instead; then Amtrak would have around $1.3 billion for FY2014. This would not force any shrinkage of the Amtrak system, but it would delay for another year any significant improvement. Amtrak has placed in service a limited number of the new Sprinter Electric Locomotives. Six of those have left the factory. Also progress is being made on 4 to 8 of the new long distance cars being manufactured by CAF Industries.